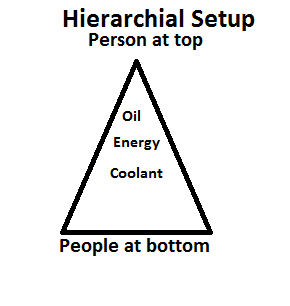 Hierarchy is tough to understand and explain. It is relatively much easy to explain hierarchy in industries. Because one machine and numerous output. So, logically the person synchronous with working of machine can be considered at a higher hierarchy. The person who carry machine output products to trucks may be considered at a lower hierarchy. Why not one of the persons who carry output be at higher hierarchy? Because, many workers are needed and in a hierarchy tree more numbers are below and only a few are at top. But it is the responsibility of everyone to see that machine is well lubricated and coolant are put at right time. But should the persons lifting output be concerned ? Yes, it is their concern too. Even though they may get a rest when machine is down, but they should understand that the truck also becomes idle. And the truck chain will get disturbed and food supplies coming in may be affected. Most of the bureaucratic setups, offices, factories, industries necessarily need to follow hierarchy. i.e. one work plan and many workers. I must also mention here that maximising work can be an objective of this setup. This implies that complete and wholehearted belief in fairness is essential. Refer to http://www.measuringbehaviour-ravi.blogspot.com for further clarity. So here are good wishes and hope for complete faithful adherence to above suggested system.